By Dan Ambrose: Unbeaten Floyd Mayweather Jr. is reportedly getting $40 million to fight WBC welterweight champion Victor Ortiz, according to the latest boxing news. That’s huge money for Mayweather, and to get that kind of bread you got assume that Golden Boy Promotions, Mayweather’s promoters, are expecting huge pay per view numbers for the Mayweather-Ortiz bout on September 17th. I don’t know how Mayweather can make that much unless he’s getting a giant 90-10 purse split with Ortiz. Even then, I just don’t know how popular the Mayweather-Ortiz fight will prove to be among boxing fans. To be sure, Ortiz has a following among the large Mexican community in the United States but he’s only now starting to make a name for himself after beating WBC welterweight champion Andre Berto last April. If Mayweather can get $40 million for Ortiz, then there really isn’t any point in Mayweather going through the hassles of trying to make a deal for a fight against Manny Pacquiao. I mean who needs Pacquiao if you can get $40 million fighting the likes of Ortiz. Mayweather wouldn’t have to deal with any weight penalties and would be able to get things slanted in his favor in terms of negotiations. 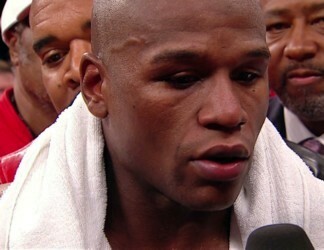 Other issues like drug testing would also be a breeze for Mayweather. Ortiz and Mayweather are reportedly already on board for the Olympic style drug testing that Mayweather had wanted before he would face Pacquiao.